Whether it is a holiday or her birthday, it is time to choose a gift for that eight year old girl in your life. Daughter, niece, granddaughter, cousin, or friend, you want to get something special that will pique her curiosity and make her smile. 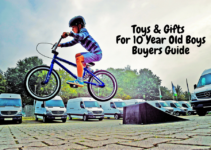 Choosing toys and gifts for 8 year old girls may seem like an obvious, even easy choice, but there are certain considerations to factor in when it comes to choosing a gift for a particular age group. The following guide will take you through some of these important considerations and an overall idea of what you should be looking for when you go out to purchase toys and gifts for 8 year old girls. 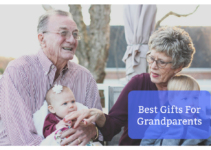 Afterwards, we will offer a few of our favorite toy suggestions for this age group for you to consider. The stages of mental and physical development for children, boys or girls, is a crucial part of their overall development as healthy individuals. Picking out toys and gifts that can help improve their overall development via interactive learning and/or exciting endeavors are the perfect addition to supplement their lifelong learning adventure. This does not mean, however, that every toy is good for every child at every stage of development. It is important to choose the best toys for that child’s age so that they can fully enjoy the experience. While this guide will focus on eight year old girls, the range of six to eight is the overall developmental stage that these girls fall into, and it is a good idea to understand the stage so you can better understand your individual girl. Once kids reach the age of six, they are preparing to fully enter the world of school, and will begin forming more lasting relationships with friends that they will likely be involved with throughout their formative schooling years. As these children experience the world with eyes and minds that are gradually being expanded, they will begin to ask a lot of questions. They are curious and they want to understand what they are seeing. Their minds are at the perfect age to absorb new information and begin learning healthy (or unhealthy) habits that will likely stick with them from here on. Once kids reach age eight, their need for mental stimulation is reaching a peak, and they will be more likely to find social interactions more and more important. This means more friends, more sleepovers, more potential drama. They are slowly becoming aware of the adult world and its intricate differences from their own, and they will either be more willing or at least more able to help out around the house. Eight-year-olds are beginning to grasp a sense of independence, and it is important that you carefully balance your response to this new idea: allow them room to move freely, but ensure that discipline is still an important aspect of your parenting style. Sometimes, the right toys or activities can help these young rascals exert their independence without causing too big of waves. There are three major learning styles that all people fall into in one way or another: visual, audio, and kinesthetic. These are not absolute as most people tend to blend them in their unique learning styles, but it is likely that every individual will lean toward one style more than the others. Any eight year old should be showing signs of their unique learning style at this point in their lives. They may enjoy writing and find it easier to understand concepts that are visually practiced, or they might like to just sit and listen, finding the auditory teaching style more conducive to their understanding. Still others will prefer hands-on learning where they can utilize all of their senses, particularly touch, to better understand the world around them. When you start your search to finding the best possible toy or gift for an eight year old girl, it is crucial that you understand how your child learns and thus which toys will best complement their unique style. Just as every adult has their own unique interests and personality, so, too, do eight year old girls. Some will enjoy the stereotypical “girly” activities that involve bright colors, hair, dolls, and the like; others will enjoy more physical activities that get them outside and moving. And still others will enjoy quiet times and toys that are geared more toward a learning aspect than a “play” aspect. 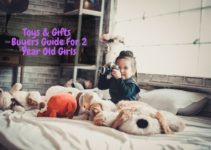 Rather than step into a toy store or the toy aisle of your local store and pick up the first object that advertises itself as the perfect choice for young girls, make sure that you are choosing a gift that will complement your child’s personality. This way, you are sure to choose something that will be more rewarding both for you and for the child. For that little warrior in your life, why not try a Nerf bow and arrow set? 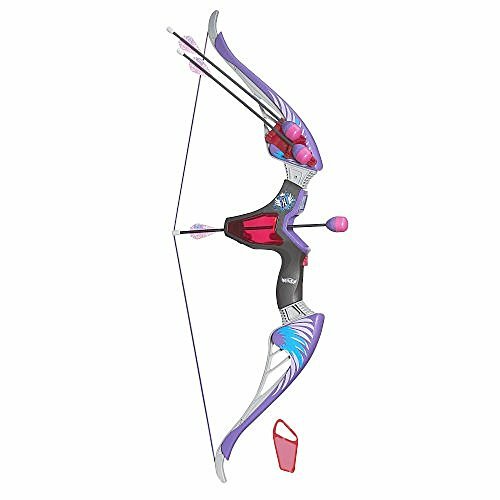 This Nerf Rebelle Agent Bow offers the fun of learning how to shoot a bow with the added bonus of offering 3 secret message darts that require an included special decoder to decipher. Let your child flex their independence in two highly effective ways, all the while having fun shooting foam-tipped darts at approved targets. The bow itself measures 2.5 x 30 x 12.2 inches and comes with 3 secret message arrows, a decoder, and a quiver (the decoder and quiver can easily attach to the bow). The boy is able to shoot arrows up to 85 feet and has an electronic red-dot sight that will allow your child to line up their shot for greater accuracy. In this world of futuristic technological advancement, learning how to use a drone early could be a real asset to a child’s future growth. This Quadcopter is small and comes equipped with an HD 2 megpixel camera so that your child can experience the magic of mechanical flight while expressing her creativity through aerial photography. As this is a toy drone, the flight time lasts about 7 minutes at a time, and it is very lightweight (1.45 lbs total). 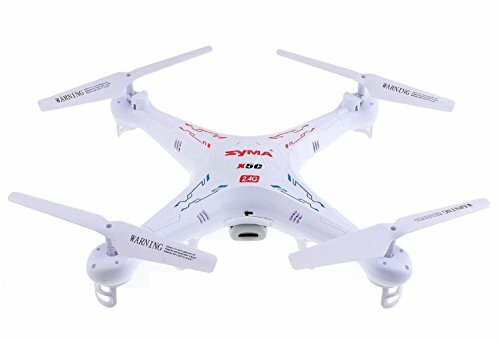 This drone is perfect for beginners and children under adult supervision. It comes with a 2.4 GHz remote control with an LCD display and a USB charger for the drone’s battery. The drone measures 16.5 x 12.2 x 3.8 inches and would be a great gift for the girl who enjoys flight, robotics, and/or photography. This is the perfect gift for the budding fashionista in the home. 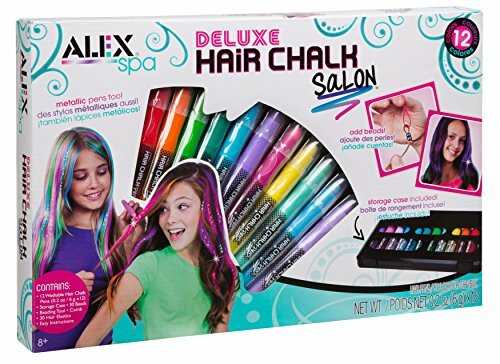 Whether on her own or with friends, the Deluxe Hair Chalk Salon gives the opportunity for your child to experiment with a variety of hair colors that can easily be washed out in the shower when the fun is over. This kit comes with 12 washable hair chalk pens in a variety of bright colors, 30 beads that can be added to the hair, a beading tool, a comb, and thirty hair elastics all held in a plastic carrying case. Plenty of tools for your child to develop their imaginations and create exciting new looks. This extensive art kit has a ton of options that will inspire your young artist-to-be to create a variety of beautiful and imaginative art projects. Get your child into the fine arts and let their creativity shine. 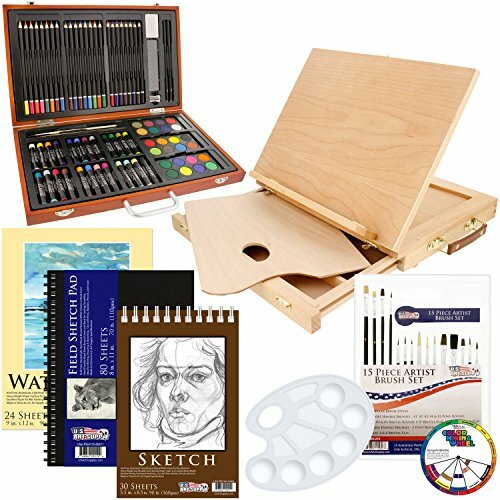 This deluxe art kit will help foster a sense of independence and artistic innovation in your child for years to come. Exercise your child’s cognitive and puzzle solving skills with this exciting and immersive balancing game. 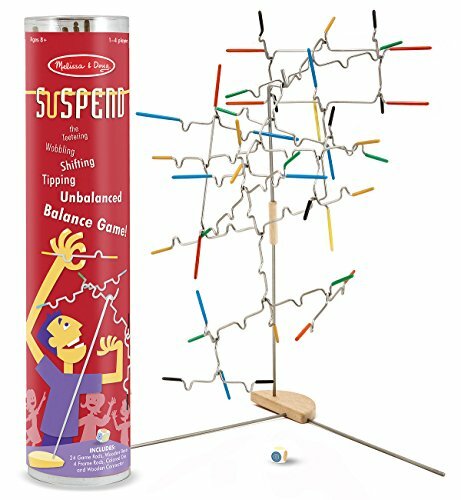 The game consists of 24 rubber-tipped wire pieces that each player adds to a growing tower one turn at a time. As the tower grows, it becomes less stable and requires more careful consideration of placement. One wrong move and the whole thing comes tumbling down! This game is made for 1 to 4 players and is a great idea for a family game night. The game itself includes 24 wire game pieces, a wooden base, 4 frame rods, a colored die, wooden connector, and instructions on how to play. This toy is perfect as both a fun game and a way to help your young eight year old develop her hand-eye coordination and cognitive reasoning as she searches for the best way to build the tipsy-turny tower. 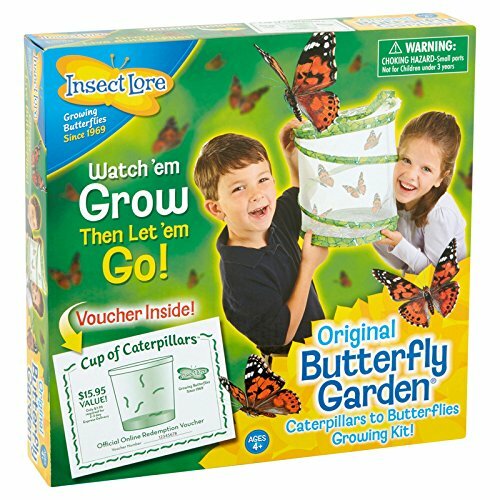 Help your child learn about the wonders of nature and life with this butterfly grow kit. Each kit comes with 5 baby caterpillars and enough food to last them until they pupate. As the caterpillars grow in their reusable mesh habitat, your child can watch their life cycle in the palm of their hands. This wonderfully beautiful and educational toy is perfect for children who are interested in natural science or just curious about insect development. Each kit comes with a feeding pipette and detailed instructions on how to help the caterpillars grow into healthy butterflies. When the butterflies are grown, your child can then release them into nature and marvel at their grace and beauty as they fly away. Afterwards, the mesh habitat can be reused to start the process again. Your eight year old is attending school on a regular basis, and what better way to make sure that she gets her daily water intake than with a water bottle that she can decorate herself? 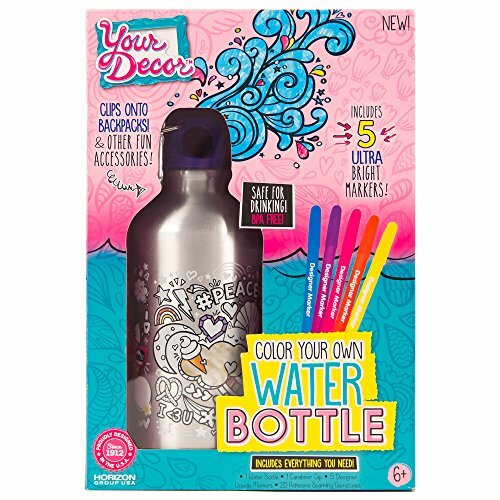 This BPA-free water bottle features an exciting design that can be colored in and stylized with the included markers and rhinestone stickers. Your child can stretch their creative and independent muscles by decorating this water bottle and then taking it with them wherever they go. The water bottle also comes with a caribiner clip so that it can easily attach to their school backpack. 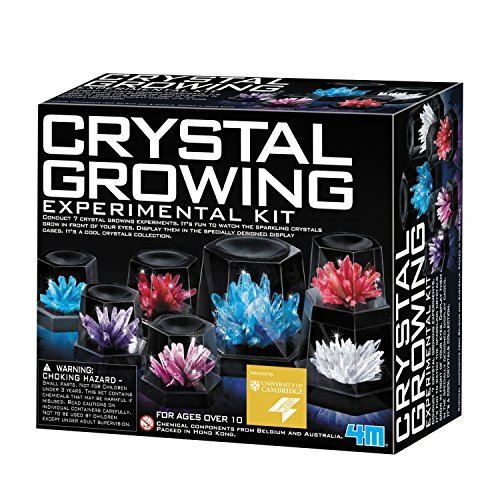 Pique the interest of a possible young geologist with this crystal growing kit that will allow them to conduct seven different crystal growth experiments in the comfort of their home. The beauty and complexity of growing crystals is both a scientific project that will challenge her mind and a fascinating experiment to watch and then keep as a shiny souvenir. Each kit comes with the necessary crystal compounds, display domes, stirring supplies, and instructions so that your child can get started growing their own crystal garden. The variety of crystal growing projects will keep your child intrigued and eager to learn more about the wonderful world of stones, gems, and crystals. 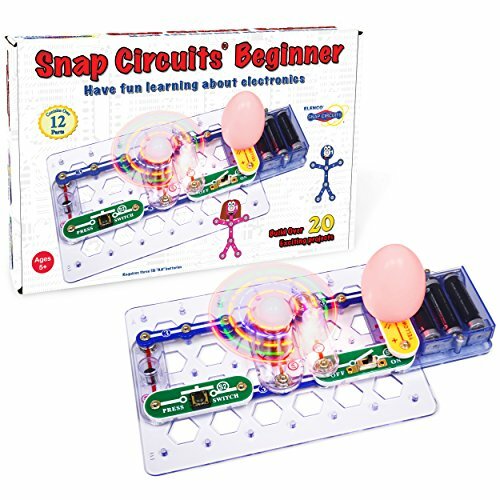 With this kit, your child can discover the wonders and intricacies of how an electric circuit works in a fun and engaging way. As this is a kid’s beginner’s set, there are a number of safety features implemented into the toy’s design to ensure that your child will be safe while learning. The kit includes 14 parts that can be used to build over 20 projects and a set of easy-to-follow instructions so that your child can get the hang of her new circuit kit without too much struggle. This kit is perfect for challenging a young mind without causing undue stress or frustration. You can never go wrong with a classic scooter when it comes to searching for the right gift for an eight year old. Get your child out and moving with this quality made and “lightning fast” manual scooter. Learning how to properly operate a scooter will help your child develop better hand-eye coordination, balance, and muscle tone as they zoom about the neighborhood. There is no assembly required, and the scooter can be folded for easy storage when not in use. The scooter measures 35 x 21 x 41 inches and can support up to 220 pounds.